Merrick Park is booming; it’s becoming an urban oasis in suburbia. 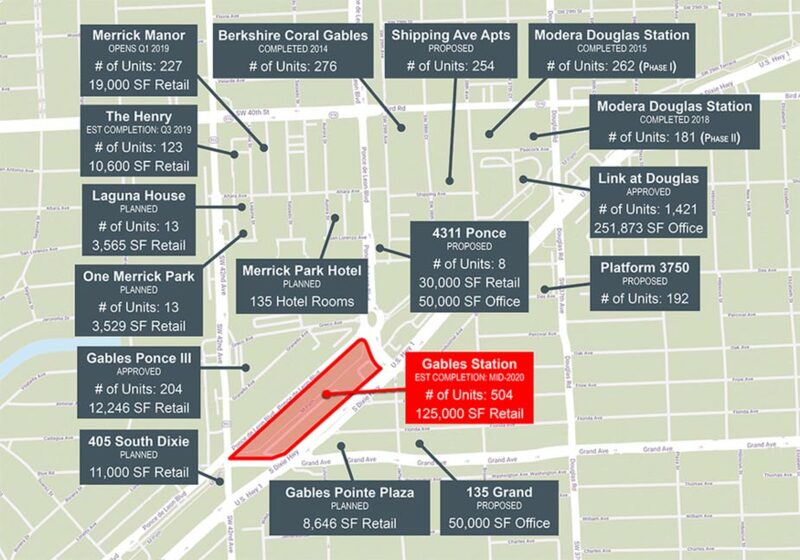 Over the next few years, Merrick Park is expected to add another 2,322 units. The neighborhood will be home to 3,538 multifamily units and 431 hotel units, placing it among Miami’s densest submarkets. Gables Station, situated at the forefront of this neighborhood on US-1, sits immediately adjacent to the Underline. Paseo de la Riviera, located across from University of Miami along US-1, is also tangential to the Underline. The Underline, which broke ground late 2018, will be a 10-mile linear park that runs from Brickell to Dadeland South. This much-needed urban safe space for cyclists and pedestrians in Miami will serve to further increase foot traffic to Gables Station and Paseo de la Riviera in an otherwise car-congested market. 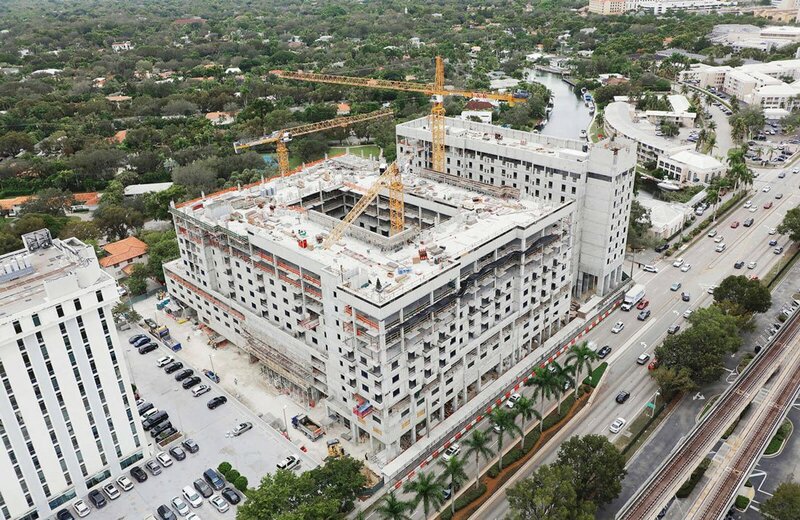 In recent years, Coral Gables has carefully managed a historic development boom. Major improvements have dramatically enhanced Coral Gables’ Miracle Mile. Now, interest and development are shifting south towards the Village of Merrick Park. The projected increase in density for this micro area is startling. In 2008, this market was home to a mere 267 residences. Since the end of the most recent recession, 910 units were added. Over the next three years, seven projects presently in various stages of development are expected to add another 2,322 units. In addition to the new residences, 319 hotel rooms and 50,000 SF of office space are planned for the area, along with 225,000+ SF of retail. The Village of Merrick Park rates well regarding connectivity and walkability. The area’s central location allows residents convenient access to every major market in Miami-Dade County. With a walkability score in the 90s, the Village of Merrick Park is among Miami’s most walkable markets. By 2021, The Village of Merrick Park will be home to a staggering 3,538 multifamily units and 431 hotel units, placing it among Miami’s densest submarkets. During the next three years, investors are projected to spend over $250 million on land acquisitions, with construction investment nearing $1 billion. Among the planned developments are the Link at Douglas by 13th Floor Investments and the Adler Group. With groundbreaking scheduled for early 2019, this development will be located on seven acres of surface parking lots at the Douglas Road Metrorail station and will include 970 residential units with a grocery store, a public plaza, retail and more. A competing project is being built just down US-1 by NPI. NPI’s development, Gables Station, will have a three-acre park running through its 553 apartments and 66 hotel rooms, with a 90,000 SF Life Time Fitness serving as its anchor. The Village of Merrick Park provides everything today’s residents want. Once an industrial section of Miami-Dade, the neighborhood has quickly evolved into an ideal live-work-play environment. Paseo de la Riviera presents a new integrated design and operating program that the market is missing. REC\reate blends the well developed ideas of food halls and coworking spaces with NP International’s concept of an Urban Living Room to create a true live / work / play environment. By creating a more flexible and inviting ground floor of the development, the development decreases the risk of any single tenant failing, and creates a valuable amenity that residents are willing to pay for. Miami’s 10-mile Underline breaks ground. This could change the city. 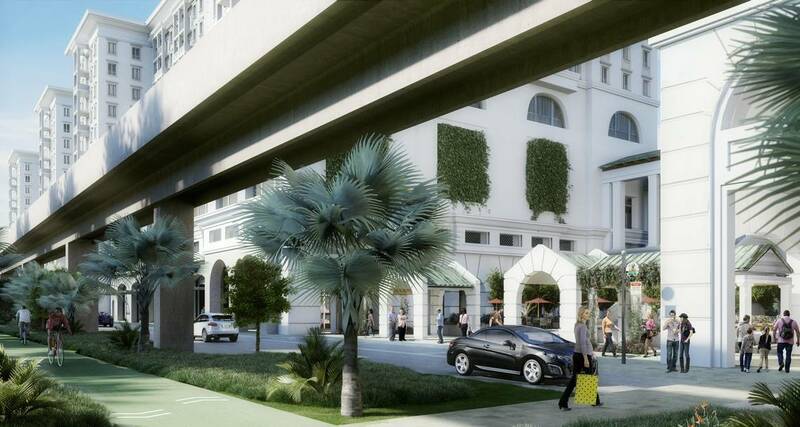 The Underline, a 10-mile linear park that will run under the Miami Metro rail line, has broken ground. The park will span from Brickell Station to Dadeland South and has the potential to transform the southern corridor of the Magic City into a lush and interesting public space. By creating a safe and inviting transit corridor for pedestrians, cyclists, and public transit riders, the Underline hopes to take cars off the road and reduce traffic on US-1. The plan is to take an existing path and create separate paved trails for bikers and pedestrians. On either side of the trails would be spaces for activities, including an area for large events, such as yoga classes and movies. The spine of the Underline already exists—runners and bicyclists use the existing bare-bones path under the Metrorail infrastructure to head north and south on a route parallel to U.S. 1 between the Dadeland Mall area and Miami. It’s a radical idea for Miami: A flowing, expansive urban safe space for people to walk, bike, recreate and congregate that’s intimately linked to transit. The Underline would not only connect neighborhoods and improve quality of life for the 125,000 people who live within a 10-minute walk of the trail, but also promote Metrorail use and commuting by bike by making both more appealing and convenient. A rendering of the Gables Station mixed-use project, now under construction along South Dixie Highway, includes a conceptual image showing, at left foreground, how a portion of the Underline trail and park could look. NP International will pay $3 million to build a quarter-mile trail segment which is now under design and will include Coral Gables’ first dog park. Megan Daly, the visionary of the Underline and founder of Friends of the Underline, has been coordinating the efforts for this park project at rapid speed over the last five years. What Daly’s doing—in close collaboration with Miami-Dade County and its transit agency, which have pitched their full weight behind the Underline—is just short of Herculean. A master plan drawn up by High Line designers, envisions parallel but separated pathways for people on foot and people on bikes. Lushly landscaped with native species, the trail would connect a series of parks, gardens, playgrounds and other gathering spots whose look and feel relate to neighborhood surroundings that range from intensely urban to placid suburbia. The Coral Gables segment, which stretches between Douglas and Le Jeune roads, includes a quarter-mile piece to be built by Brent Reynolds and his firm, NP International. Reynolds is also the developer of Gables Station, the mixed-use project under construction along Ponce de Leon Boulevard. Architects designed the Gables Station building to face the Underline. An expansive courtyard will connect Gables Station to the trail, and the ground floor of the project will feature retail and other “activated space.” The concept is to get building residents out to the Underline, and Underline users to the retail—just the kind of symbiotic flow that Daly envisioned. It’s also an attractive lure for potential residential and retail tenants, Reynolds said. Reynolds plans to start building the Underline section in the second quarter of 2019, and it should be ready when Gables Station opens in late summer 2020, he said. The final pour was completed in November, ahead of the construction schedule. 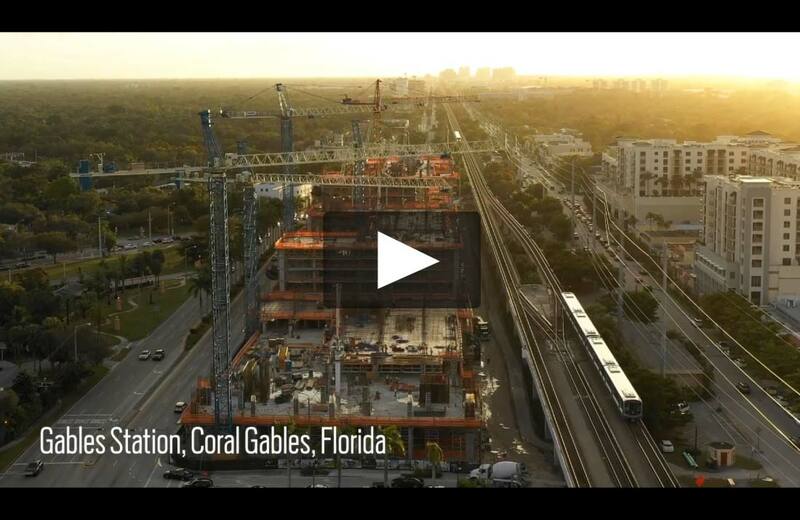 Gables Station is a high-density, mixed-use transit oriented development (TOD) project located directly adjacent to the Miami Metrorail line, and a short walk to the Douglas Road Station. The project contains a diversity of uses, and the design creates extensive high quality public space throughout the project for the enjoyment of the residents, visitors, and locals. The project’s location across from The Underline, a 10-mile linear park and urban bike trail makes the walk to and from the metro station of exceptional quality. The Underline gives pedestrians and bicyclists access to the region at large, connecting the project to a broader transportation network. The project is designed to connect right into this regional amenity creating multiple connections and entry points. The Gables Station project meets all of the TOD Elements for Certification, receiving a 3-Star Award of Excellence top rating Certification. This project will contribute significantly to redefining and transforming the gateway to Coral Gables into a walkable, mixed-use destination, and help stimulate a trend of similar projects to be developed along the metro corridor. Over time, this project will work together with other new projects in the region to reduce traffic congestion, reduce sprawl, increase metro ridership, and encourage the development of additional compact, walkable, and bikable neighborhoods. Paseo de la Riviera is a unique, pedestrian-friendly, mixed-use transit oriented development (TOD) project located across the street from the University of Miami metro station and campus. This project represents a new direction for Miami development—away from the typical single-use, car-oriented pattern of development so prevalent around Miami, especially along S Dixie Hwy in Coral Gables. Paseo de la Riviera is an exceptional example of the new form of pedestrian-friendly development and placemaking that’s proven highly successful around America, especially in the Washington, DC area–the national leader in transit oriented development. The Paseo de la Riviera TOD project is situated on the historically congested S Dixie Hwy in Coral Gables–best known for the University of Miami, the Biltmore Hotel, luxury homes, and sleepy streets. Coral Gables is evolving as a desired location to live, work, and shop for young professionals, students, retirees, and empty nesters alike, many of whom are looking for interesting, walkable places to live–with less driving. Paseo de la Riviera is the type of development that offers this lifestyle being located just steps from the new pedestrian bridge into the metro station, and a major new regional bike trail, the Underline. The Paseo de la Riviera project is a groundbreaking opportunity for the City of Coral Gables (and the greater Miami area) to achieve its stated goals of reducing traffic congestion, while simultaneously increasing metro ridership. The Transit Oriented Development Institute is proud to endorse this project as a great national example of mixed-use, walkable and sustainable urban development, especially as this project is among the first of its kind in the Miami region.